A sign in the yard and being on the MLS is NOT good enough. You shouldn't settle for anything less than TOP NOTCH marketing! 1. Realtor.com - The #1 Internet Search Site Used by Buyers I pay extra to get my listed properties featured on the front page of Realtor.com the single most visited website for buyers, and my sellers pay nothing extra for this service. 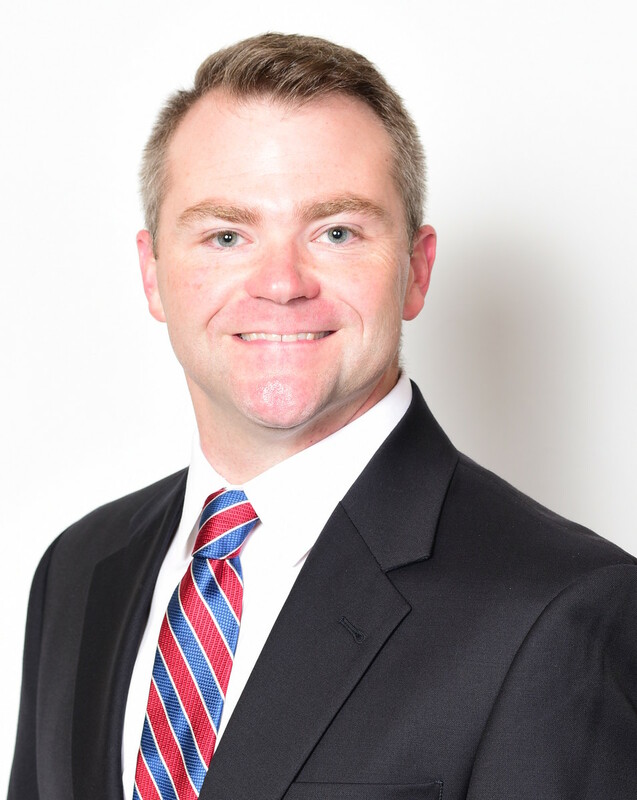 Within 2-6 months, each property on average, is viewed thousands of times on-line and purchased by a buyer who finds it on the internet.If you know of a property that needs to sell, I can have it featured with top placement, 25 photos, and a Virtual Tour. You want your home to stand out and get noticed on the number one search site nationwide and homes with numerous photos get noticed more. Only select agents with Featured Home status or Enhanced Listing contracts can provide this for you. Your listing will be enhanced with up to 25 photos on Realtor.com instead of the standard 4 photos allowed to non-subscribing agents. 2. 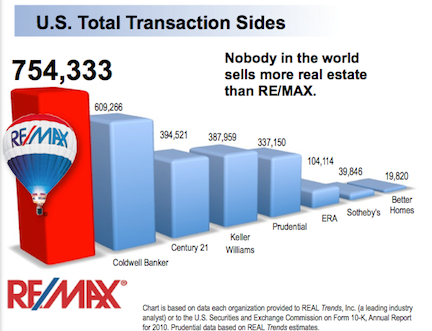 RE/MAX and REMAX.com - The #1 Real Estate Company website in the WORLD! Discover the power of the Brand. 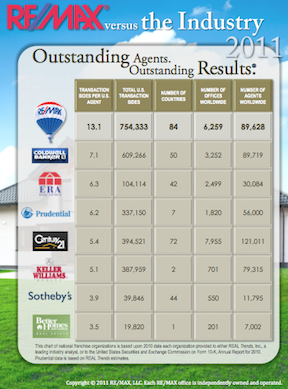 RE/MAX offers the most competitive marketing solutions in the industry, see what the brand can do for you. •Most Share of Voice in national TV advertising. 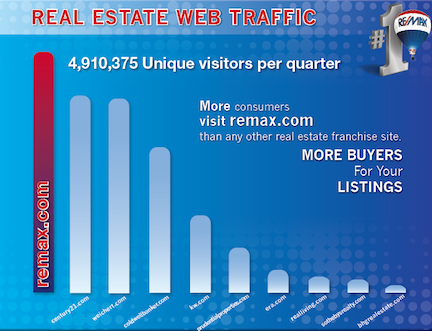 •Most visited real estate franchise website (remax.com). 3. Enhanced Internet Presence - TOP Real Estate Websites! With more than 90% of homebuyers beginning their search for a home on the Internet, I use this knowledge to market your home to tech savvy buyers. Your listing is syndicated to many of these partners and more: Zillow, Trulia, Realtor.com, ReMax, Craigslist, Yahoo, MSN, Homes.com, AOL, Front Door Real Estate, and literally THOUSANDS more! 4. Youraddress.info - Flyers in the yard are for Sellers, NOT BUYERS! "Here you go Mr. and Mrs. Seller, I put flyers in your yard. Arent you proud of me?" Flyers DO NOT bring in leads for your home. You will have a sign in your yard with your own personal website YOURADDRESS.info. Buyers go directly to your home vs searching for it online. It's amazing how much difference this makes in bringing in buyers for your home. And no more soggy flyers where the ink has bled! 5. Video Tours / Online Open Houses - 24/7 - Have you noticed that many virtual tours simply repeat the same photos used in the MLS? BORING!!!! I create VIDEO tours, not the same boring photos put to boring music! If a picture is worth a THOUSAND words.....how many do you think a video is worth? See what my videos look like below! . 6. Social Networking - Believe it or not, social networking is a successful tool to get your listing noticed, shown by local agents, and seen by prospective buyers. I post new listings, video tours, and price reductions to my Facebook account. Click here to see my facebook page. 7. Multiple Photos - Want to know the #1 thing that immediately turns a buyer away from looking at your home on the internet? HAVING ONLY A FEW PHOTOS! There are a ton of agents out there that will only put a few photos of your home online. I DON'T THINK SO! NOT ME! I usually put anywhere from 12 - 40 photos online of your home! 8. Direct Email Program - An email blast of your home's listing is sent to a database of clients, customers, business associates, and other top selling agents. Potentially, this email will reach thousands of email addresses. 9. Feedback - Follow-Up Activity Reports of Showings - Superb Follow-Up Service for Feedback to You! 10. Seller Reports - You will receive WEEKLY reports on the online activity of your home. You will be able to see what days your home was most active and how many views it received the previous week. This information is HIGHLY useful by informing you of whats happening in the Real Estate market!